This breathtaking diamond engagement ring from Vanna K's Hand-Engraved Collection offers a little bit of everything. This ring makes a statement with it's 1 carat pronounced center stone, delicately surrouned by a combination of round diamonds and sparkling baguettes. 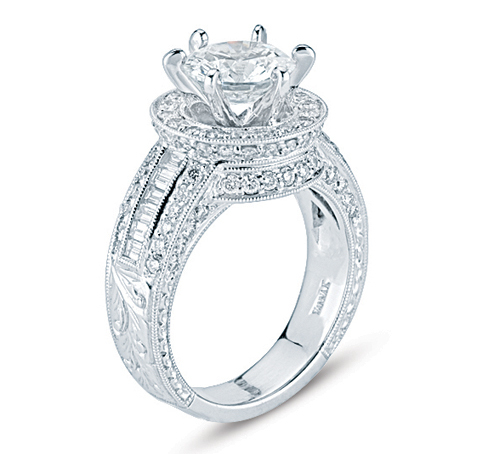 What really enhances the beauty of this ring is the beautiful hand-engraved details on the platinum band. It's an instant heirloom to be passed on and admired by all for years to come. Find your perfect diamond engagement ring today at Vanna K.